We went camping at the weekend in a field in Dorset, near Weymouth. Its about 1.5 hours away from where we live in Frome. We ‘hired’ out a field (which was surprisingly easy to do) for our exclusive use of as there was so many of us. It was very basic, with only tent toilets and thats about it as far as it went amenities wise. But thats the way we like it! Glorious unspoiled countryside views. So good for the soul. It rained really bad on Friday so lots of us with small children stayed at home as the thought of setting up a tent or pop up caravan, and then dealing with over excited children in the torrential rain did not seem like a fun idea. So we got everything ready to go the night before, bed early for everyone, got up nice and early and arrived at the same time those lucky people with older children who will actually lie in, where just getting up for the day. And the next day the sun shone! (intermittently) . We all went down to ‘Man O War Bay’ which is one of our favorite beaches, right next to the famous limestone rock arch and beach of Durdle Door. 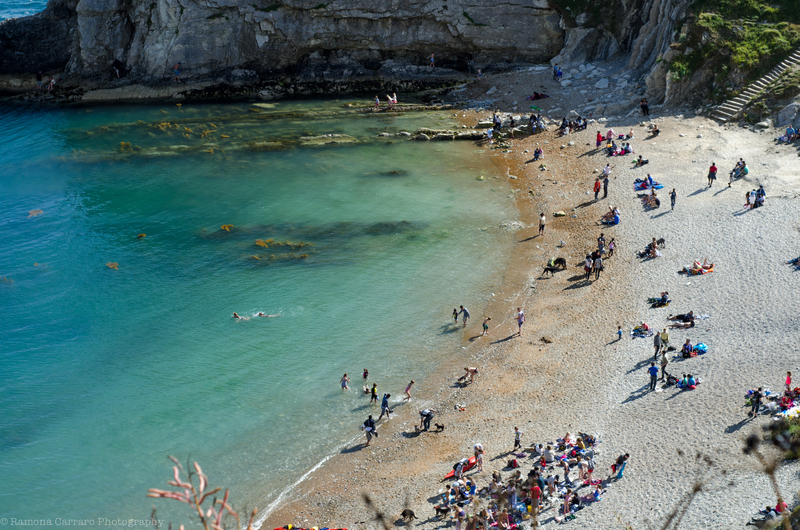 We prefer Man O War bay, mainly, because of the lush and almost Mediterranean water and the fact it is very calm and great for swimming, as the rocks that are little bit away from the shore break the waves. Its not sand this side though I’m afraid the other side is. But at least you don’t get sand in your pants.. and your nappies.. and your buggy.. and your car. Although I wouldn’t recommend taking the buggy down the steps. We carried the younger ones from the car park and our friend who brought her buggy down to the steps just left it at the top of the steps, in a little area that looked like it was unofficially a great place to leave buggy. After our day at the beach we headed back to the camp for our greek themed BBQ. Good blog girls – interesting beach – looks lovely.